Ultimately we had excellent weather last Saturday and a good turnout of people. As usual I won’t comment much on what the “vehiculoids” did – we’ll leave that to Al. Billy Cheshire and Tom Miller attacked the gooey front fuselage on T-1, continuing to clean the wood and metal fittings in preparation for varnishing and painting. In the afternoon Roger himself picked up a paintbrush and was painting fittings. The fuselage structure is looking much better – they made great progress! Soon the fuselage will look like T-2 and we can start bringing both airframes back to flight together again. I don’t think any progress was made on the wings – I’m not sure there was really room in the shop to lay one of those out as well. And we still need to clean up the main landing gear on T-1. 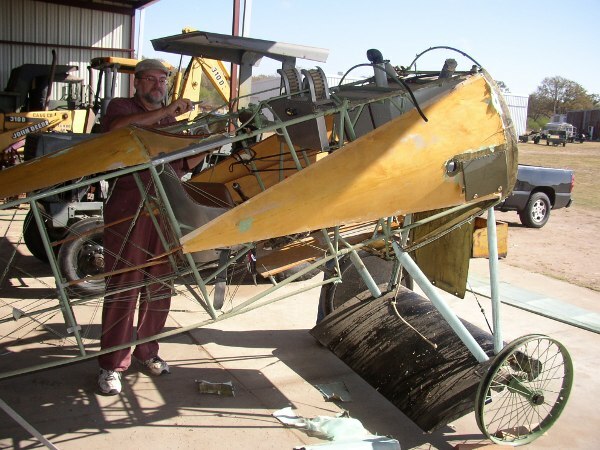 The Fokker Triplane repair continued, with Steve Freeman, Dave Orloff, Dave Edgerly and Ron Marcotte dragging the fuselage to the shop area and stripping the fabric off the fuselage. This unit needs various bits repaired and it was decided we could do a more thorough job with the fabric removed. Dave Edgerly also made more progress on the engine swap, fitting parts to the old Tommy motor. Still no word on what might be wrong with the Triplane’s engine! Art has been productive in the wingtip repairs, the wing tips are recovered and silver doped – they are almost ready for color! 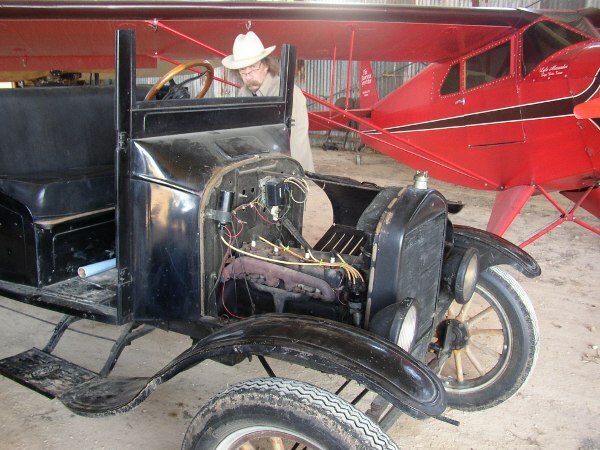 One small downer – in disassembling the fuselage it was discovered that an elevator tip was tweaked out of alignment. Roger feels this will be a simple repair. The starboard wheel is slightly tweaked – Richard Smith said he would check with a wheel repair shop he knows in Austin to see if straightening the wheel is possible. As for team vehicles it was a somewhat light day. The glass oil level indicator had not filled with oil and gave us some cause for concern at the airfair but I was able to diagnose the problem as air in the glass and a loosening of the nut brought the oil to a proper level. Lynn took on the more challenging job of tweaking the transmission bands on the wrecker. Lynn went after the electrical issue and the usual suspects did not solve the problem, indicating that we have an issue that was getting worse. We are thinking the points and condenser should be replaced and we will try that next workday. For now it is out of action. The water was drained from the Wrecker and Signal Corps truck in recognition of winter. The TT still has old antifreeze but it ought to be sufficient. Andrew exercised the Kingsbury Special and went battery hunting. They were finally all located and we will need to do an evaluation of them for the future. I finally saw a window to work on the Choctaw and worked on it into darkness. After some advice from various folks improvements were made, Terry helped me shorten the drive chain and suddenly after everyone had left, even Roger and Steve were inside, all the stars aligned and the Choctaw was running without throwing or breaking the chain==and no one was there to see it. I went back on Sunday and did some more work and it ran even better once I sorted out the issues. I also painted the fender and oil can and chain guard but the wind was a real aggravation. The bike should be all together by next workday with markings and will stop looking partially completed. This project isn't complicated but you can only cheat so much on it; chains are not forgiving.